Moninda Marube speaks to a crowd about the realities of human trafficking in Santa Barbara. As he began his 18-mile route up Spring Road in Auburn, two large, and uninvited guests lumbered onto the path in front of him. The pair of bears weren't expecting Marube either, heading out for their normal morning drink at nearby Auburn Lake. "It was the most horrific thing. Really, it's been traumatizing," Marube said. Marube grew up running regularly in rural Kenya. Always one of the fastest on his team, Marube said he never feared the typical African wildlife that lived in his area. "Bears aren't like lions. They can climb trees, swim, run ... they can do everything. I thought for sure my debt was sealed," he said. Within seconds the bears were heading toward him at full speed and Marube made a decision. He ran. The professional athlete had completed a race just the day before. His 18-mile run was suppose to be his "easy day," but Marube found himself running faster than he ever had in his life. Luckily, Marube found a screened-in porch of a nearby empty cabin. He hid on the porch as the bears sniffed the flimsy screen, before finally deciding to abandon their chase. As soon as the bears turned out of sight, Marube left the porch and ran in the opposite direction. "People have told me I should have called 911. But I think help would have gotten there faster if I had told them I had jumped into Lake Auburn, which is a protected water shed, then if I said I was being chased by bears," he joked. The resident of Auburn is well known for his good character - always offering to help out, and with a good sense of humor. Marube is a regular volunteer with the Police Athletics League, and has initiated various running clubs for area youth. This fall Marube will begin his sophomore year at UMF, volunteering to help train the school's track and cross country teams. The assistant coach beamed when talking about the team. "I've never seen such dedicated runners. This is going to be a great year, I think. This is the time for UMF and I'm so excited to be a part of the story," he said. Since escaping the attack, Marube has found himself telling his own story to numerous reporters, including those from BBC and Good Morning America. Although many people now know Marube due to the bear incident, his story goes much deeper. 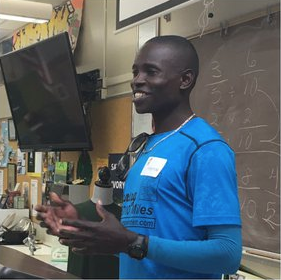 After escaping an extreme life of distress in Kenya, Marube came to the United States, where a man offered to manage his developing running career. He, along with a group of other African runners, quickly fell into the grips of their manager, who had locked up their passports and was manipulatively stealing their winnings from races. The group was watched closely by the man. They weren't allowed to speak to anyone in public, and only had short outings to necessary places such as the grocery store. As Marube realized the reality of the situation he was in, he made a plan of escape. One evening while the man was gone, Marube quietly stole his recently expired passport and left the house, urging the others to come with him. "They couldn't find the courage to leave," he said of the other runners. Marube spent the next few months struggling to organize his new life. With an expired passport, and little to no money, things were difficult. Finally Marube hit a breaking point and ended up pushing himself harder than he ever had by contacting organizers of the Santa Barbara Half Marathon. For the first time since escaping his corrupt manager, Marube felt brave enough to relay his story. The race coordinators were quick to encourage Marube to register for the race, and offered to buy him a plane ticket, which Marube refused due to his expired passport. Instead, they put him on a bus to get to the race. Winning the race was a turning point in Marube's life for several reasons. It was the first time he had competed for himself, not for a corrupt manager. But more importantly, it connected Marube with his future host father, Dan Campbell, who was one of the race coordinators. Now Marube lives with Campbell and his family, in a house that Marube describes as a community house- the Campbells often have people staying with them who need a little extra help. Marube is an integral part of the local community, encouraging kids to run and educating people on the realities of human trafficking. He has also started a campaign to raise awareness towards the issue, running from Maine to Washington D.C. and then another 3o to 40 miles six days a week back in Auburn to represent the 3,700 miles between Maine and California. Marube hopes to run the full route some day, with sponsorship to support his cause. "I fully understand the meaning and purpose of doing something greater than myself. Life is way bigger than all of us and our dreams contribute to making life interesting and inspiring," Marube writes on his website. When he isn't running, Marube is reaching out to local schools, educating kids through his story. 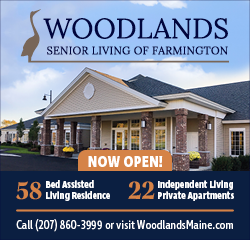 Heartwarming story, and great to read the welcome he has received in Maine. What an inspiration and a great role model. it's heartbreaking to hear another story of human trafficking and I hope this story gets the attention it deserves.. I'd read about the bear adventure in other venues, but had no idea it was this local man whose life has had so many turns. I'm glad to hear that Mr. Marube is having such a happy life with the Campbell family. I wonder if the authorities have been able to track down his corrupt previous manager? And help his friends who did not have his courage to escape? This poor guy gets away from two bears in the woods, then gets chased down by a Bulldog. Think the Bears went after him because they saw him running..Bears are predators. It's just instinct. We live in an area that bears are seen frequently but no one has been chased..if you make noise they leave right away. "We live in an area that bears are seen frequently but no one has been chased..if you make noise they leave right away." @Marie...He has lived and ran in Maine for five years..NO one has told him this? Guess he knows now.. If the bear had wanted him, it would have had him, probably curious young bears! What an inspiring and wise young man, ""I fully understand the meaning and purpose of doing something greater than myself. Life is way bigger than all of us and our dreams contribute to making life interesting and inspiring," Marube writes on his website. Thank you being you and sharing your joy and interesting story with us, Marube. Wow.. So inspiring. What a narrow escape it was.. You such a brave young man, big ups..